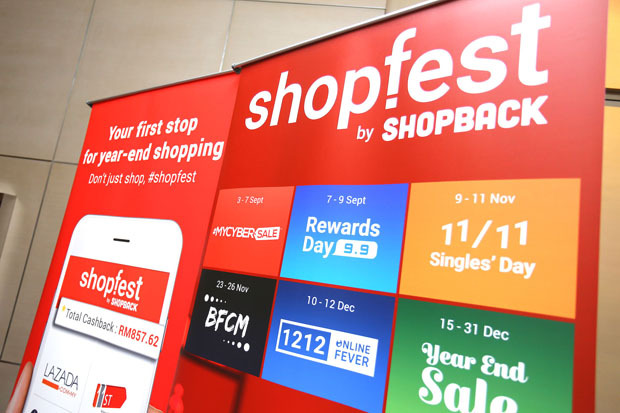 Its latest campaign, ShopFest, taps into this as well, being a regional retail movement designed to help Asia Pacific consumers navigate the labyrinth of year-end sales and empower them in making smarter purchase decisions from September to December. KUCHING: ShopBack’s unique business model provides a win-win situation for consumers, partner stores, as well as ShopBack — and it continues to grow thanks to growing market opportunities and constant technology enhancement. This comes as Shopback Malaysia started operations here in February 2015, helping over one million Malaysians to save more than RM25 million to date. Co-founder Sharmeen Looi outlined Shopback’s function as a loyalty platform – consumers go to its partner stores via ShopBack and make a purchase, and they get to receive an incentive. “The key differentiation is we give cashback instead of points or credits,” she told The Borneo Post. “The cashback not only can be withdrawn to your bank account, it also doesn’t have a monthly cap of RM50 like credit cards’ cashback. “It is unlimited savings from all your online spending including travel bookings, product purchases, mobile top-up, groceries and food, and so on. This promises an attractive marketing return on investments, Looi said, and is evident as it now works with more than 500 partners. “We subsequently share our commission with consumers as cashback,” she added. “Malaysia has approximately 25 million active internet users and it represents 79 per cent of the population, of which 15.3 million are online shoppers – that is 50 per cent of our population. The high number of online penetration in the country makes it a huge potential market for every e-commerce player, Looi said. From this, ShopBack Malaysia hopes to increase its users from one to multimillions in the next few years as it anticipates a bigger pool of online shoppers waiting to be tapped on. “In Malaysia, we collaborate with more than 500 partners like Booking.com, Expedia, Lazada, 11street, Taobao, ZALORA, Hermo, Nike, Foodpanda and many more. It is crucial to keep up with the consumer shopping trends in order to serve the needs of our partner stores better. “For that, we expand the cash out options to include Maxis bill payment (phone bill) and Petron Miles conversion to enable a smarter and integrated digital lifestyle for our users. “ShopBack also has a dedicated Mobile App team to test and improve our app features regularly. Our new APP interface makes it easier for users to discover online stores and keep them posted on their cashback status.